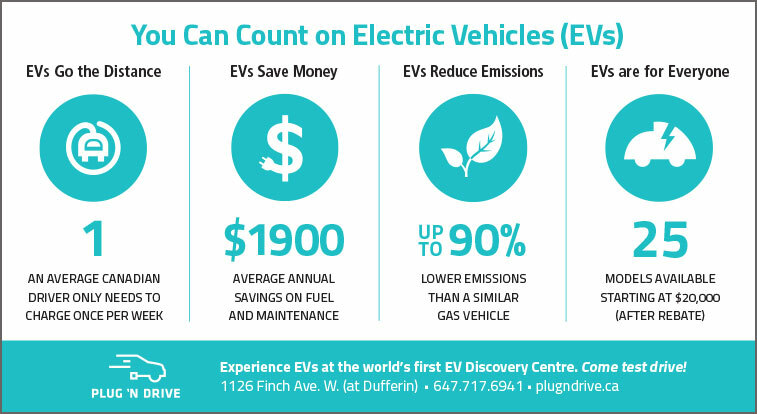 Plug’n Drive is a non-profit organization established in 2011 to inform the public about the benefits of EV’s and accelerate their adoption in Ontario. 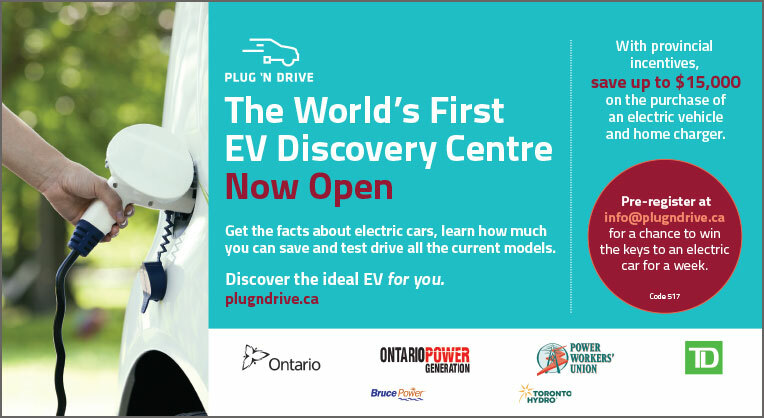 In 2016, the Ministry of the Environment and Climate Change made the groundbreaking decision to endorse Plug’n Drive’s opening of the world’s first Electric Vehicle Discovery Centre, where Ontarians could have a unique opportunity to see all current makes and models at one location, be informed by trained EV knowledgeable, unbiased, non-sales staff and test drive the vehicles. Up Marketing was put in the driver’s seat of the marketing campaign that launched the Electric Vehicle Discovery Centre. We kicked off Plug’n Drive’s media campaign in our Clean50 Special Report in the Globe and Mail, for which Up Marketing’s creative team developed editorial to dispel EV myths, alongside an ad to promote awareness of the EV value proposition and a set of icons in an infographic that would become core elements of Plug’n Drive’s brand collateral. Animated digital ads were developed to promote the online Clean50 Report material and drive traffic from the Globe website to Plug’n Drive’s. Our Clean50 editorial on the Globe’s site was then linked directly into the Google Search campaign, where it continues to get exposure today. 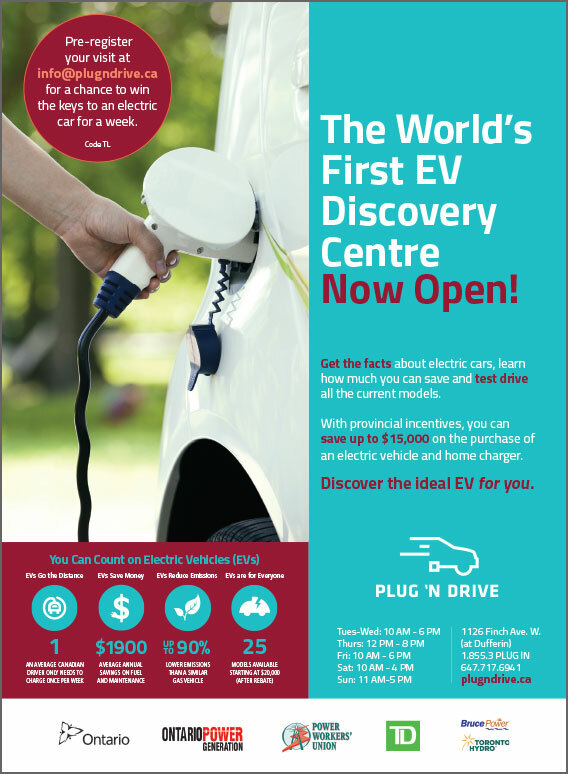 In January, we began planning the transition from the promotion of the EV value proposition with Plug’n Drive as its best resource to promoting the introduction of the world’s first Electric Vehicle Discovery Centre. 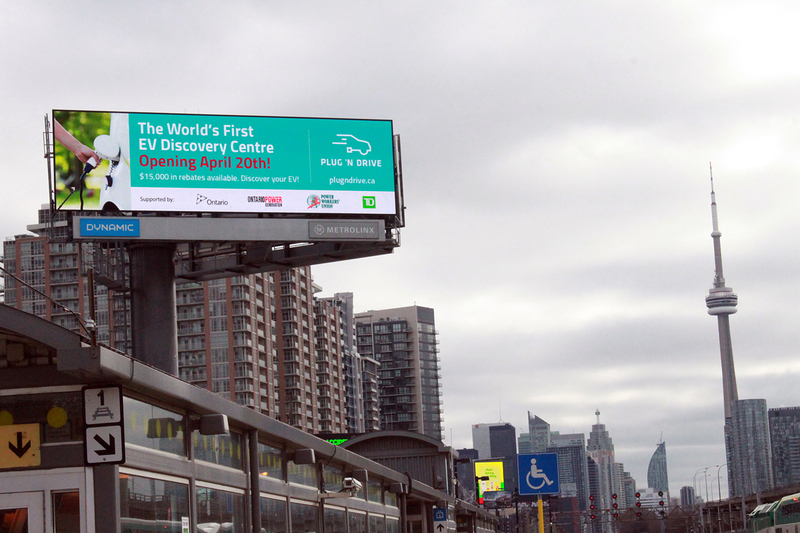 Our campaign drove traffic to Plug’n Drive’s installation at the Canadian Auto Show’s inaugural Electric Avenue and to the Green Car Test Drive at the Green Living Show. Dynamic Search ads inviting auto-shoppers to compare EVs with non-EV options performed exceptionally well along with ads based on other key message points. To support the announcement of the Centre, we produced an oversized postcard to be both handed out at Plug’n Drive events and distributed with well targeted, high quality local print media in geographically significant target areas. The design incorporated the icons and infographics we introduced in the Globe in the fall. GTA driver awareness of the opening of the Centre was further supported through the rotation of wall mounted banners in Toronto’s Green P parking lots. For online exposure, we added Centre specific ads and call-outs to our Google Search campaign, while making a connection to the $15,000 in government rebates. We then launched a Display Campaign to introduce the centre with animated HTML5 display ads on news and automotive websites. In the weeks before opening, we placed a pre-announcement of the Centre’s launch on digital super-boards on high volume GTA driving routes such as the Gardiner Expressway and in high traffic locations near the Centre’s location, switching ad copy to “Now Open” in April. In print, the Centre was announced with an ad in Toronto Life’s annual Best of the City guide. Finally, in approach to the official Grand Opening in May, we added radio to the media mix. The grand opening was led by the minister of Environment and Climate Change supported by a panel that include the heads of Ontario Power Generation, The Power Workers Union, Toronto Hydro and The Electrical Safety Authority. The showroom was packed to capacity and press coverage was excellent, which will be amplified through links in our Google Search campaign. 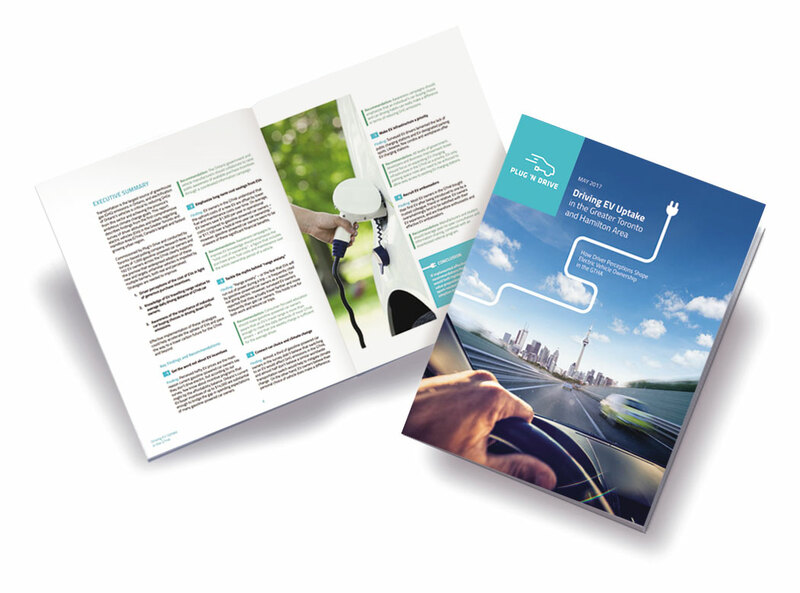 The following week, Plug’n Drive and Toronto Atmospheric Fund jointly released Driving EV Uptake in the Greater Toronto and Hamilton Area, a 16-page report resulting from a year’s collaborative research and an extensive survey of area EV and non-EV drivers. Up Marketing designed, laid out and illustrated the report our Plug’n Drive icon set and original custom graphics. While we’re pleased to receive acknowledgment from Plug’n Drive of the value of Up Marketing’s contribution, the most important recognition came in the Centre’s opening week, when they had to buy more Ipads to check in the line-ups of car shoppers that came to learn about, test drive and order electric vehicles. It’s been an electrifying ride indeed, and one that, according to targets set by the Government of Ontario, is going to require the ultimate in high-performance handling to deliver the EV sales goals set out in their Climate Action Plan to reduce Ontario’s GHG emissions by 80% by 2050.